These models usually feature two full size burners and are the closest thing to recreating a kitchen experience out in the wilderness. They provide lots of heat, too, up to 20,000 BTUs, for cooking meats, stews, and dishes for a crowd. Propane does burn very hot, though. At home, you have the luxury of cooking on a stove that sits in one place, and you don’t need to find the perfect location. But, out in nature, you do have to pay attention to the best location for cooking. Choose an area that is protected by the wind, since wind is the most common deterrent to outdoor cooking. Find a flat and reasonably level surface that is swept free of natural debris, like leaves, twigs, and other materials. You don’t want a flame anywhere near something that could potentially catch fire, so use caution. A flat tree stump would be a perfect location. You want the spot to be as stable as possible to prevent your stove from possibly tipping over. With your location cleared and your flat surface ready, take out both your stove and your propane fuel tank. Follow the stove’s user’s instructions carefully to connect the stove to the fuel tank. This will depend on the stove. In some models, like the Coleman Bottle Top Propane Stove, they fit vertically on top of the propane. You’ll first put the tank in its round holder to keep it upright and stabilize the tank. Then simply twist and screw the stove in place. Other models, like the Coleman Classic Propane Stove, feature two burners side by side and needs a lot more space to set up. It will fit on a tabletop near your car or campsite, so bring an extra portable table or you can set it up on a picnic table. It fits the small green propane tanks, and it comes with a connector. Simply screw the propane tank into the connector, resting it at an angle. These propane stoves are not recommended for indoor use, so only use them outdoors; they give off too much heat. With the stove connected to the propane tank (and any cooking grates removed), it’s now time to light either the stove itself or the burners. The two burner models have valves that you can adjust, similar to using a propane grill. Turn the valves to the low position, and you’ll hear it start to “hiss.” Use a simple lighter or match to light the propane gas in order to create a flame at the burner site. But the vertical propane camping stoves come with a thick black knob that juts out underneath the cooking plate. It has two settings, either low or high. With the valve set to the “low” position, use a lighter or match to create a flame in the burner ring. 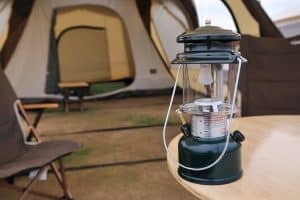 You can cook as well outdoors as you can indoors with a propane camping stove, simply by fine tuning the cooking temperature. With the vertical propane stove models, you only get two choices of either low or high. That’s enough to cook most foods. The two burner stoves have knobs to adjust from low to higher. Once the stoves are on and burning, adjust the flame strength using the valves or knobs. They burn blue and can go pretty high to create a rolling boil within about two minutes. When using your propane camping stove, you can pack a full set of standard cookware and be able to use it. Depending on the burner size and your stove’s configuration, these can fit up to a 10” wide skillet and larger saucepans, too. One deterrent for outdoor cooking is the wind. You can purchase a separate wind screen for the vertical propane camping stoves. The two burner models use their wide lids as wind screens. Propane doesn’t burn as efficiently as some other types of fuel, so the smaller green 5 lbs. tanks don’t go as far. You could cook for about 20 minutes roughly 12 to 14 times on one tank. On some models, you can adapt to use a longer connector with a larger tank, similar to a tank for a full-size grill. However, with the vertical model, you are limited.